The first quarter of the year is over – we think it’s about time to treat yourself to a little getaway. Give yourself a well-deserved break with an impromptu trip to one of the Zen-est places on earth: Ubud, Bali! Here are 5 things you can look forward to in Ubud this month. Check out the most anticipated foodie event in Bali! The Ubud Food Festival, where culinary masters explore the best of Indonesia’s food, puts Indonesian cuisine in the spotlight. Over three days, chefs from all over Indonesia will gather to celebrate the country’s stunning produce, diverse cuisines, and fascinating culinary traditions. This year, the Ubud Food Festival focuses on the theme of “Generasi Inovasi”, exploring future of Indonesian cuisine. A multitude of events is taking place from masterclasses, where experts impart a few tricks of the trade, to food tours, where you can see how food goes from farm to plate. The festival only takes place once a year, so make sure you take the chance to explore Indonesia’s rich culinary culture. If you’re looking for an adrenaline rush and an exciting afternoon, look no further than the Ayung River. The Ayung is one of the most challenging rivers for whitewater rafting in Bali, filled with waves up to four feet high and narrow channels that will send the boat jostling. There’s plenty of splashing to go around too! Apart from the thrilling ride, you’ll also get to see plenty of fascinating sights. As you paddle through the 10-kilometre stretch of river, you’ll pass by magical unspoiled rainforests, exquisite wildlife (if you’re lucky, you may see the Blue Javan Kingfisher), and enchanting rice fields. The river also contains several surprises, like hidden waterfalls and ancient stone carvings on its walls. We’re sure you’ll be hungry at the end of your exciting ride. Lucky for you, we’ve got just the place to satisfy your growling tummy. Kubu at Mandapa serves up European and Mediterranean in a cosy setting inspired by the traditional huts used by Balinese farmers to store rice. It’s the perfect place to unwind and relax, tucked away snugly in the restaurant’s cocoon tables with a view of the Ayung gurgling just below your feet. Find it at Mandapa, a Ritz-Carlton Reserve, Jalan Kedewatan, Banjar Kedewatan, Ubud 80571. Ubud is the centre of culture and art in Bali, so it’s no surprise that the town is a great shopping destination. Let your inner shopaholic run free at Jalan Raya Ubud, which is lined with a multitude of boutique clothing shops, art galleries, and museums for your perusal. Don’t forget to turn into one of its small side roads and explore the hidden treasures there as well. Monkey Forest Road is definitely worth a visit, and not just because it’s got some of the best clothing shops. It’s also the road which passes by the intriguing Ubud Monkey Forest, a sanctuary for grey macaques. Another thing that makes Jalan Raya Ubud a great place to spend your afternoon is the amazing food. Here, you can find a variety of restaurants and cafes to fill your stomach, including Hujan Locale by Will Meyrick. This Scottish chef fell head over heels for the spices and flavours of Southeast Asian food and has since set up several stellar restaurants around the region celebrating this unique cuisine. At Hujan Locale, you’ll find authentic Balinese classics with a slight twist, served in a rustic restaurant that has a quaint yet sophisticated charm. Here’s a small tip: try to get a window seat on the upper floor, so you get great views of the streets below. Find it at Jalan Sri Wedari No.5, Ubud, Bali 80571. 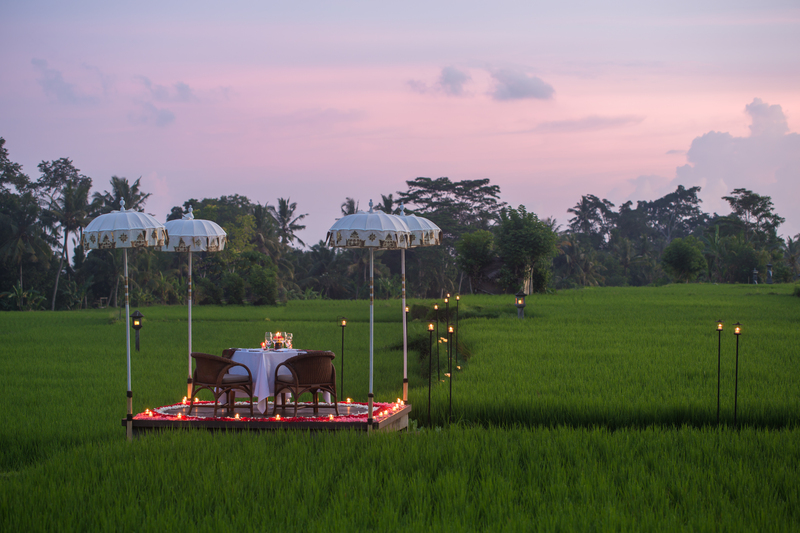 There’s nothing as quintessentially Balinese as its rice paddy fields. Imagine rolling fields of supple green stalks rustling in the wind, stretching out as far as the eye can see. If you’re there close to the harvest, you’ll be treated to a golden sea of bowed ears of ripened rice. Take a day to cycle or walk along the fields, soaking in the beautiful vistas Bali has to offer. Walking along paddy fields is an amazing experience, but eating in the middle of the paddy fields is equally fulfilling. At The Restaurant at The Chedi Club, you can view enchanting vistas of Tanah Gajah’s emerald paddies, set against the backdrop of Bali’s sacred mountains, while dining on gourmet Asian and Western cuisine. Don’t miss their authentic Balinese foods, complete with bumbu spices that are prepared fresh every day. If you loved the food so much, you wish you could have it every day, go for the cooking class conducted by the restaurant’s very own “Mama Bali”. Ibu Ni Myoman Adriani dishes out pearls of culinary wisdom to classes of up to six guests, so you can have a taste of Bali in your own kitchen. Philippine-born Spanish maestro Don Antonio Blanco is the most famous painter to have called Bali home. His enthralling and fanciful works will capture your imagination with their depictions of regal Balinese women in elegant, exquisite poses. In the museum, you’ll enter Blanco’s world, an exotic mix of oriental Balinese and extravagant Spanish influences. Perched on a hilltop overlooking the lush Campuhan valley, the museum was, in fact, Blanco’s home. Visitors can explore the entire museum grounds, which includes not only the extravagant house but also family’s temple and its paradisal gardens. You’ll also get to eat at a brand-new gourmet restaurant dedicated to giving you the best dinner of your life. BLANCO Par Mandif is a snazzy new restaurant sporting an impressive degustation menu. You’ll fall head over heels in love with the delectable dishes, made by the award-winning chef Mandif. Everything on the menu is a celebration of Balinese cuisine. Full of local flavours and using only the best of the best seasonal ingredients, Chef Mandif will take you on a gastronomic journey you’ll never forget. Find it at Kompleks Museum Blanco, Jalan Raya Tjampuhan, Ubud, Gianyar, Bali 80571. Lest we forget, check out these Chope Exclusives in Bali while you’re at it! Trust us – your wallet (and stomach) will thank you.